Pieter Bensch, executive vice president Africa & Middle East at Sage, says it is important for small and medium size businesses (SMEs) to build up a fund for a rainy day. He said SMEs are often so inundated with advice about saving money that it can become difficult to know what to implement and what to ignore. That is why he clears up what he calls a few "a few common small business money savings myths". Saving money every month should be non-negotiable, no matter what your circumstances. If you’re waiting for your turnover to increase to start saving, that day will probably never come. There will always be another excuse – even when you are earning more. Consider saving a percentage of every invoice, even if it’s a small percentage – you can increase it once you’re used to putting money away every month. Further, the sooner you start saving, the sooner you’ll start earning compound interest, which is basically free money. Saving should be the first thing you do when you’re paid. Think of it as investing in yourself and your business. Once you’ve paid yourself, pay everything else with what's left. You might need to revise your budget at first to make it work, but regularly reviewing your finances is always a good thing. 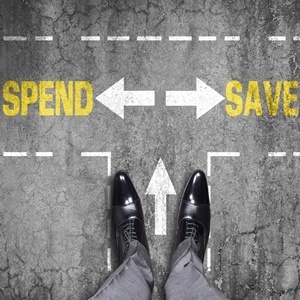 Yes, there might be a big-ticket item that you are savings towards, like a delivery vehicle or new shop fittings, but you shouldn’t need a reason to save money. In fact, it's just as important to save for the unknown and the unexpected. What would you do, for example, if a fire destroyed your office and you had to pay a massive insurance excess? Where would you get the money from? What if it’s month-end and you’re still waiting for that large corporate or government entity to pay for services you delivered three months ago? How will you pay your staff and suppliers when you’re having cash flow problems? Saving money is never a bad idea. Unfortunately, you'll only realise this when you’re facing a cash crunch and have no safety net. Putting your money into a savings account is convenient because you can see it and you can access it whenever you need it. But being able to quickly and easily access your money increases the temptation to make impulse financial decisions. Another disadvantage of saving money in the bank is that you don’t earn much interest. Putting your money in investment accounts or buying shares, however, produces greater returns, especially for long-term savings. It's true that saving can feel almost like a grudge purchase. It might not be rewarding to save money for an emergency one day. But when that day comes (and it will), you'll be glad you did. You'll save yourself the stress of accumulating debt or scrambling to secure finance, which can be especially difficult for small businesses. Start by setting a financial goal – like saving the equivalent of six months' revenue – and take small steps towards it. Cutting operational costs in your business is a quick way to free up money that you can invest.